The University of California Berkeley is setting up a new division dedicated to data sciences to build on the momentum it already has in the discipline. A popular Foundations of Data Science (Data 8) course has continued to draw "unprecedented numbers of students," according to the university; enrollment grew from 100 in fall 2015 to 1,300 in fall 2018. Its advanced follow-on, Principles and Techniques of Data Science (Data 100), grew from 100 in fall 2016 to 800 in fall 2018. These courses are designed to serve students from any major on campus, whether or not they have programming experience; the idea is to give them tools to apply data science no matter what their fields or interests. In addition, the institution has launched dozens of other new courses, as well as a data science major. 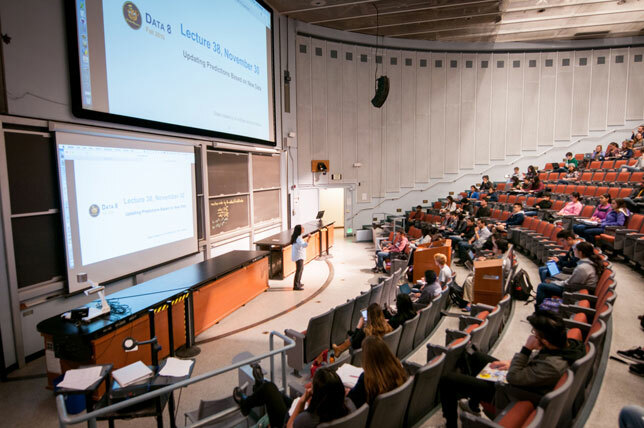 Berkeley already offers several related master programs and runs the Berkeley Institute for Data Science (BIDS), along with several other research centers. The new Division of Data Sciences connects departments from the College of Engineering, the College of Letters & Science and the School of Information. It will be led by a new associate provost, who will report directly to Paul Alivisatos, executive vice chancellor and provost. The hope is that the structure of the new division "will accelerate" research and creation of new multi- and cross-disciplinary programs of study, including exploration of the "social, economic and environment impacts" of pervasive data. This year, the university noted, almost a quarter of its open faculty searches sought applicants who could explore aspects of data science in their respective fields. And within the program, the university is seeking a diverse representation. In fall 2018, for example, half of the students in Data 8 are women, 11 percent come from an underrepresented ethnic or racial group, and more than half have little or no computer programming experience. Those enrolled represent 68 different majors. "The division's broad scope and its facilitation of new cross-disciplinary work will uniquely position Berkeley to lead in our data-rich age," said Alivisatos in a statement. "It will simultaneously allow a new discipline to emerge and strengthen existing ones." "The creation of a new cross-campus data science division at Berkeley will ensure not only that all Berkeley students graduate with high levels of data literacy, irrespective of their majors or concentrations, but also that we are positioned as a research university to both accelerate computational research and at the same time to come to grips with the human, social and political transformations the digital revolution has instigated," added Carla Hesse, dean of the Social Sciences Division and executive dean of the College of Letters and Science. The ethical implications of the technologies are an important aspect of the study of data science, emphasized David Wagner, professor of computer science at Berkeley and an instructor for the Data 8 course. "What does the world look like when decisions are made by algorithms rather than people, and how do we ensure that when we analyze data our decisions reflect not just numbers but the humans behind them?" he said. One graduate, Vinitra Swamy, said that the emphasis Berkeley is placing on data literacy is creating "a very talented pool of graduates — employable in traditional computing and engineering fields as well as a variety of others." Swamy works as an artificial intelligence engineer at Microsoft, after graduating with a bachelor's degree (2017) and a master's degree (2018) in computer science at Berkeley and serving as head graduate student instructor of Data 8. "The best part of the data science program is that the skills taught in the courses are immensely valuable to industry and research. I use data science tools I learned at Berkeley every day," she said. "It is pretty clear that almost every field today needs data-savvy researchers. It has become something as basic as driving a car in our intellectual work," added Saul Perlmutter, director of BIDS and winner of the 2011 Nobel Prize in Physics. "Data science — and the new division — offers the university community unusual opportunities to bridge what can otherwise be disparate disciplines. It's exciting to see the social scientists, the humanities scholars, the natural scientists and the computational and statistical scholars all in the same conversation, with novel collaborations beginning to address previously intractable and fascinating questions."